Two weeks ago, I attended the African Studies Association Annual Meeting in Indianapolis, Indiana. As Sean mentioned in a previous post, a bunch of folks from Africa Is A Country got to meet up and get to know each other outside of our usual digital constraints. I also presented on a panel entitled “Digital African Studies: State of the Field” with some of my MSU professors, Walter Hawthorne and Ethan Watrall, as well as some digital scholars working at Harvard, Carla Martin and John Mugane. Professor Mugane is the Director of the African Language program in the Department of African and African American Studies at Harvard, as well as the project director of African Sources of Knowledge Digital Library (ASK-DL). The ASK-DL project is “a pioneering initiative in the identification, recovery, integration, consolidation, and dissemination of information contained in rare handwritten and out-of-print African language documents of non-latinate scripts.” The site consists of three main sections: a digital collection, a library, and Odù Ifá, a Yoruba language preservation project incorporating video and text. 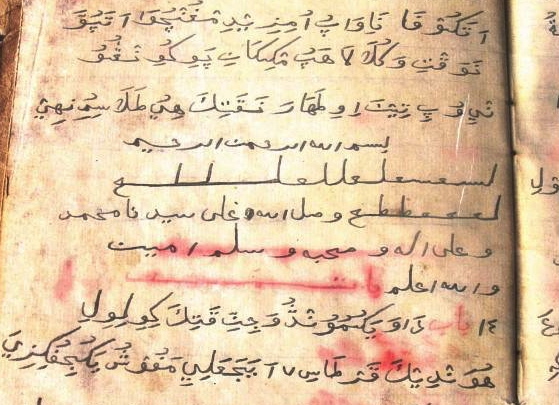 The document collection housed on ASK-DL is composed of mainly hand-written documents pulled from unpublished booklets, poetry, essays, private letters, and other documents in Amharic, Bamanankan, Pulaar, Swahili, Tifinagh, and Wolof scripts. This section of the site also contains a few printed documents in non-latinate scripts, including some recent documentation on Ebola in Bamanankan. Additional references on these endangered languages are found in the Catalog, which houses documentation and links to other texts on these highly specialized African languages. In addition to these great resources, the ASK-DL project also works to preserve these languages in their spoken form. The Odù Ifá sections contains videos of native Yoruba speakers reciting chapters from the Odù Ifá, a book of wisdom used within the Ifa sacred divination system. These videos are great resources for scholars interested in the Odù Ifá itself, as well as for students aiming to learn Yoruba. Hearing the language performed by native speakers, along with transcripts and translations, allows for a unique opportunity to combine aural and visual learning in language acquisition. Let’s hope that ASK-DL continues to incorporate more projects of this type as they continue to develop this resource. Check back next week for the first of a two-week series on digital slave trade datasets.